Here is a question submitted by one of our readers on the penetrating power of small arms as a result of the post Ammo Penetration Can be a Problem in Home Defense. I am posting this for you to make comments and suggestions to help answer his questions. Some of you know more than me on this subject. Will water in a 55 gallon drum be better than dry sand in stopping a 7.62mm bullet? I know ballistics testers use water tanks to test fire guns. I’m building my first home in a bad neighborhood and want exterior protection against random drive-by shootings. Might just go with brick masonry which would at least “slow down” any bullets making a hit possibly survivable. Water works, but the main reason they use it in ballistic testing is to keep bullet deformation to a minimum. If I had the choice to fill the barrels with water or sand for home defense, I would go with sand. Just remember if a 22 cal round penetrates a barrel of water at the bottom the water will run out. A sand filled barrel would be easier to repair if damaged. The information in the following link while a bit outdated from a military standpoint would probably work well for you dealing with home defense from random drive-bys, http://www.globalsecurity.org/military/library/policy/army/fm/3-06-11/ch7.htm. You can also go to http://modernsurvivalonline.com/Files/books/fm/mcwp3353.pdf and down load the US Marine Corps “Military Operations on Urbanized Terrain” (Mout) Manual and look at Appendix B.
I am aware that the 5.56 rounds have been improved since this manual was written,, but I am not exactly how much. Does anybody have a good answer? This entry was posted in security, self defense and tagged home defense. Bookmark the permalink. If hardening my home against possible small arms fire, I would certainly want to design to a worst case, using tbe older data based upon .30 caliber or 7.62mm military ammunition, such as that used in the WW2-era M1 Garand or Soviet 7.62x54mm M91/30, or similar “deer rifle” calibers, which are so common. A level of hardening sufficient to stop only 5.56mm rounds is not adequate, and can easily be defeated with common hunting rifles using sporting ammunition. Military surplus ammunition in these calibers is widely available, so it makes little sense to design to anything lesz. The best answer is to build that home in a better neighborhood. 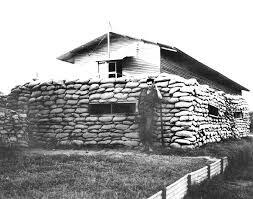 A long time ago, I helped build a home with 55-gal sand-filled drums in the exterior walls. The upside: the sun-facing walls became passive heat radiators, which was nice when the weather was cooler. The downside: after about 10 years, the alignment of the vertically-stack barrels shifted to the extent that the structural integrity was threatened – not a good thing and very expensive to fix. 2 inch think concrete walls will stop a single 5.56 round. Maybe build thick walls for the first few rounds and have a more secure “safe room” in case the drive-by becomes more than a drive-by? When the barrels are side by side, where the barrels meet there would be less protection. How would that be overcome? Two rows or barrels? I live in the safest neighborhood on earth, but I still wonder these things. I would use two rows and alternate them so that the thickest part of one lined up with the joints behind it. Won’t your neighbors become overly suspicious of what you are protecting if you start layering 55 gal. barrels around the house? If you are afraid of the neighborhood this seems nonproductive. Best is if you can address some hardening in the construction phase of a new home. For instance, a poured, reinforced concrete foundation of at least 6 inches thickness. Or a minimum of 8 inches of solid masonry. If block walls are to be constructed of hollow, concrete masonry units, fill each course of block with concrete, reinforced with rebar as you go up, or at minimum fill with gravel or crushed stone. Provide reinforcement up to window height in ground level walls, and install reinforcement around door frames and windows which permits bolting of hurricane shutters or other protective coverings. Construct a below-grade safe room or storm shelter, or reinforced safe room if no basement. The FEMA design criteria for tornado, earthquake and hurricane resistant construction also provide a useful, if minimal level of ballistic protection.